Cris Cyborg To Ronda Rousey: "Let Me Make Wrestling Real Again"
UFC fighter Cris Cyborg is once again testing the waters for a stint in sports entertainment. The former UFC Women’s Feathrweight champion tweeted a Photoshopped photo of herself in the ring with longtime rival Ronda Rousey. These two will unfortunately step into the Octagon together, but Cyborg is open to a pro wrestling match with Rousey. This is just one of the many taunts Cyborg has directed towards Rousey for months. 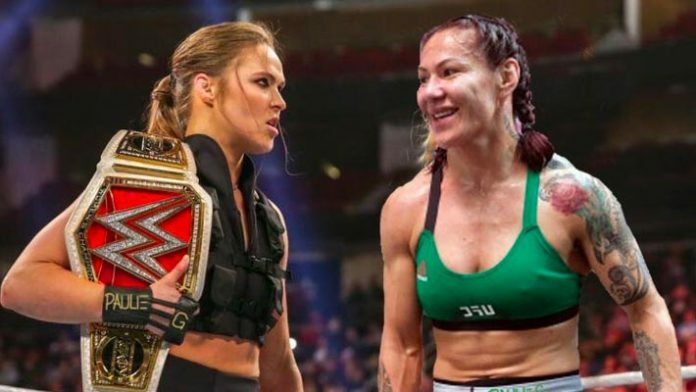 In an interview, Cyborg said that she is willing to fight Rousey in a WWE ring if she’s ever done with MMA and even willing to lose to her in a scripted match – because according to her Rousey won’t face her in a ‘real’ fight. Cyborg and Rousey have never faced each other inside the Octagon. Though Cyborg has again and again shown interest in joining facing Rousey in WWE. There were also rumors going around that Cyborg will be Rousey’s opponent at WrestleMania. While that obviously didn’t happen, but it doesn’t necessarily mean that she will never join WWE. She has been linked to the company in recent times and was even seen at the WWE Performance Center in January. All Four Horsewomen of MMA are in WWE now too, so anything can happen. Rousey, on the other hand, will be defending her Raw Women’s Championship against Charlotte Flair and Becky Lynch in a triple-threat match on WrestleMania 35. Visit our partner site MMANews.com for more news from the world of Mixed Martial Arts.